Not of Water Flesh and Blood describes the non-physical nature of grappling with circumstance, specifically the eventual taking over of our studio workspaces by another entity. Initially, the personal experience of losing one’s space is an unfamiliar one and yet when perceived from a collective Filipino historical standpoint turns into a quite familiar circumstance. The Philippines has been claimed and reclaimed by other nations repeatedly. 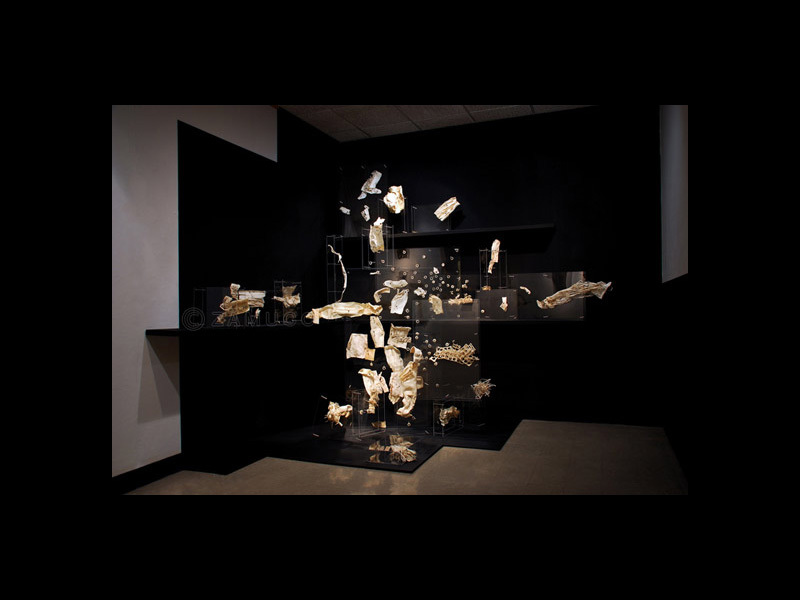 Catalyzed by the expectation of displacement, my piece was designed for the drop ceiling in my temporary studio. It was out of the way from foot traffic and storage space. It is a considerate gesture yet with a sardonic tone. Configured in a chess-like grid (a reclamation game in itself) are vacuum formed marks of aggression made from casts of my extremities. 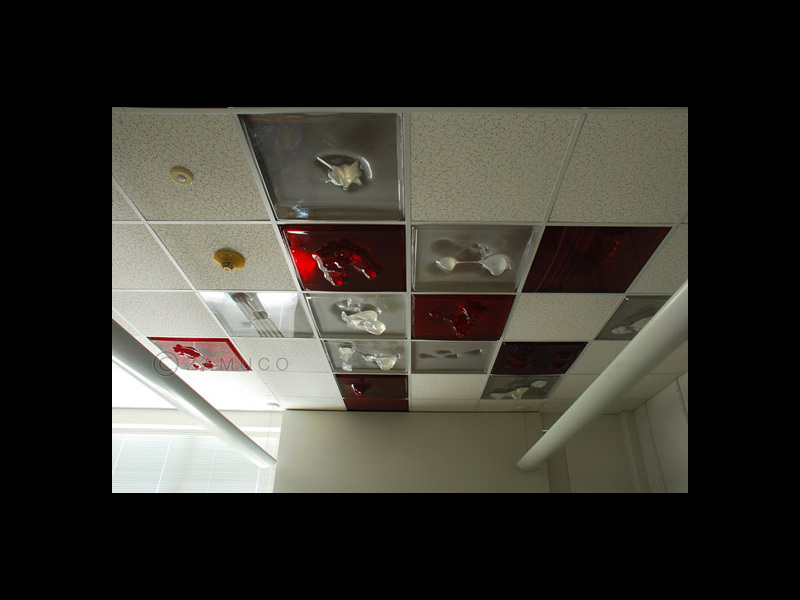 Evident in this ceiling piece is the dichotomous relationship between reclamation and submission. Other important aspects of the work are the indentations, wherein I poured bathwater. These fluids from which parts of the body have been dipped or washed have spiritual referents exemplifying further the layers of conflict between spirituality and carnality. The City of Man was catalyzed by the drastic change from living in a city of 1.5 million people (Manila) to moving to Columbia, Missouri of 85,000 people. There is a constant longing for the familiar culture of the larger city. This piece prompts questions like, “Is home a place that we go to or a place that is within us or that we bring with us?” The City of Man projects a utopian modernist financial district on wheels. The three-wheeled cart, which is ubiquitous in the urban streets of Manila, is used to carry merchandize for sale and even as a portable home for the urban poor. 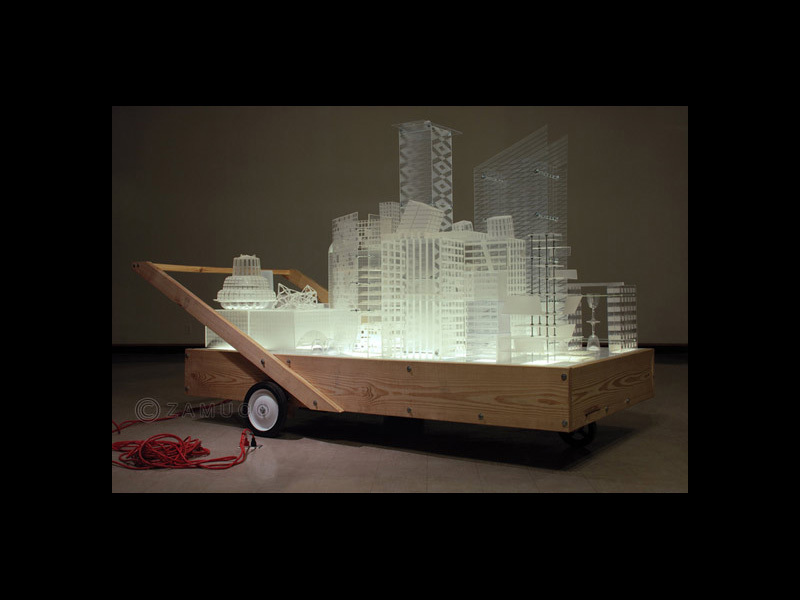 The city is made of sandblasted found plastics, mimicking the preciousness of glass. Ironically, it is a mobile home attached to a 30 ft. extension chord. All things considered, the cart is emblematic of the artifice of my own sense of security. These works serve as social commentaries but also as self-critique, as the process of making allows me to be aware of my own contradictions and artificialities. The object lessons engage the viewer to see the immaterial from banal materiality, to find knowledge for transcendence to a truly human order.